An excellent way to shoot out plugins against one another. A clever idea well implemented. 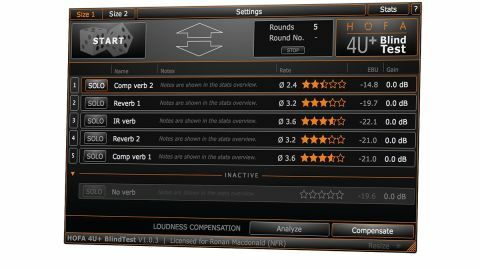 Designed for the elimination of bias when comparing similar sound sources to objectively ascertain which is 'better, 4U+ BlindTest is a plugin that enables you to randomly and blindly compare multiple tracks in the host DAW - different masters of the same song, or multiple versions of an individual track in a project, for example - to help you decide which you prefer. With BlindTest inserted at the end of the signal chain of every track to be compared, all instances of it are then treated as a single system from any one GUI, which lists every involved track, each with a Solo button, Name and Notes text entry fields, a star rating section, and a volume control. Only one track is ever actually audible (the currently soloed one), and clicking the big Start button initiates a new blind test in one of two modes - Single or Series - selected, awkwardly, from the plugin's Settings menu. In Single mode, the order of the tracks is randomly shuffled, so you never know which one you're listening to - simply solo each in turn, rating them and taking notes, then hit the Show Tracks button to reveal the names. In Series modes, an extended test of up to 99 "rounds" (the default is 5) begins. The tracks are reshuffled for each new round, which can't be started until all tracks have been assigned a rating in the previous one. At the end of the test, the Stats overview page gives you the results of every round in a single window, and each track is given an average star rating, enabling you to make your choice, er, 'scientifically'. Tracks can be excluded from testing by dragging them to the Inactive area, and optional EBU analysis delivers automatic loudness matching if required. Of course, for the test to truly be 'blind', you need to make sure the level meters in the host DAW can't be seen, to which end 4U+ Blindtest is freely resizable, so you can stretch it to cover them. You almost certainly don't need 4U+ BlindTest - how often do you really find yourself paralytically unable to choose between effects chains, after all? - but it's a solid realisation of a clever idea.